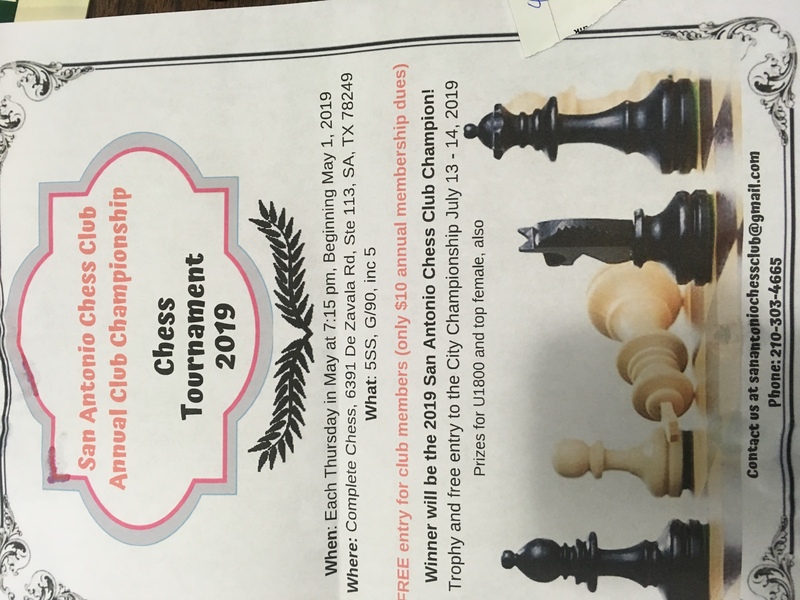 Thanks for stopping by the San Antonio Chess Club web site. We meet Thursday evenings 5:30-9p.m. (except holidays) at the Lions Field Adult Recreation Center, 2809 Broadway near Mulberry – see map (phone: 210-826-9041). This is a City of San Antonio facility, all visitors are welcome. Please bring chess sets, boards, and clocks if you have them – they are not provided at site. Every week: casual skittles, blitz tourney begins at 7 p.m. This is the new official website of the San Antonio Chess Club. We will post all major events in the San Antonio area as well as news about our local players. Please visit us on Facebook where the club’s latest events and news are posted. Prize for U1800, top female, and top GM. Winner gets Trophy plus Free entry to San Antonio City Championship July 13-14, 2019. This is a month-long event, one game played every Wednesday evening starting at 6:30 PM. Please arrive by 6:15 PM on the first Wednesday to register. Entry Fee: $15 or $10 half-prize option, with 80% returned as prizes. For more information about upcoming events, or if you have general questions about participation or involvement, please check out our Facebook group. For problems or suggestions with this website, contact webmaster at wargames1 (at sign goes here) gmail ( I don’t want spam! dot ) com.